Steel is the most durable, longest lasting material in the siding industry. We make it seamless from corner to corner to make each home we work on a CUSTOM job. Provide your family with all the comfort and charm of a Rustic Log home without the routine maintenance associated with traditional Log Cabins. 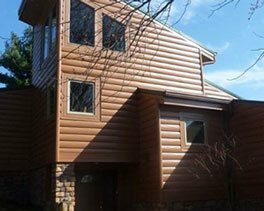 Seamless Log cabin steel siding. Replace your old drafty windows, with Energy Star rated, energy efficient, vinyl replacement windows. Covered by a no-nonsense Lifetime warranty on glass, frame and all moving parts. KME also installs Vinyl Siding, Entry Doors, Storm Doors, Seamless gutters, and much more. 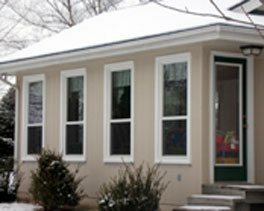 Kent Mohler Exteriors is the premier exterior remodeling company serving the Kansas City, Missouri, area, providing homeowners with top-quality house siding, as well as many other exterior products, and installing them with expert precision. No matter what home remodeling project you choose, you can have confidence in our high level of expertise and craftsmanship. Our installers have the experience and training to get the job done right the first time. At KME, we offer a wide variety of premium home siding, allowing you to select the option that best suits your needs and preferences. For example, if you’d like one of the most durable siding systems in the industry that will provide unparalleled protection for your home, our seamless steel siding is the perfect choice. 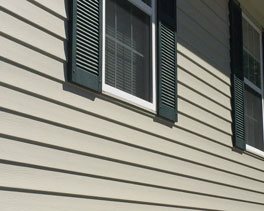 We will custom roll this siding on site to fit the exact dimensions of your home so that there are no unsightly seams where dirt can collect or insects can nest. Our steel siding is constructed from galvanized steel and coated with a Kynar® PVDF finish, so it won’t fade, rot, warp, or peel. If you’d like the unbeatable durability of steel combined with the classic look of wood log siding, our TruLog™ siding is ideal. This steel log siding is available in a wide range of grain textures and colors, so you are sure to find something that matches your aesthetic style. KME also offers Kansas City, MO, homeowners premium vinyl siding from Alside that mimics the beautiful appearance of wood without the unending maintenance. Our siding has a number of exclusive features, such as a TriBeam® Design, that gives it superior rigidity and durability when compared to other leading brands. 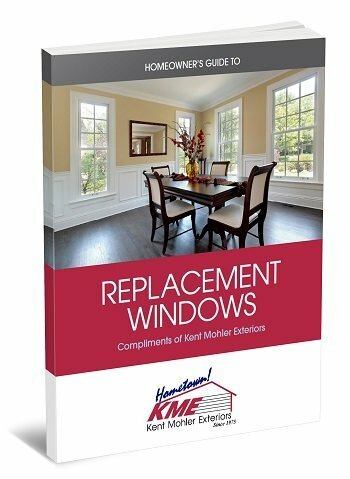 Additionally, if you’d like new siding as part of a larger exterior remodeling project, KME has you covered. 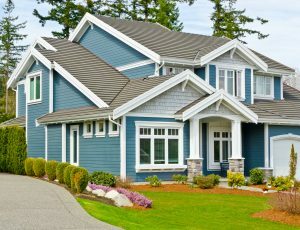 We are a one-stop shop and can install home windows, exteriors doors, gutter systems, and more. We can even offer finishing touches, such as soffit and fascia, to create a cohesive look for your home. Kent Mohler Exteriors offers much more to its customers in Kansas City, MO, than just vinyl and seamless steel siding. 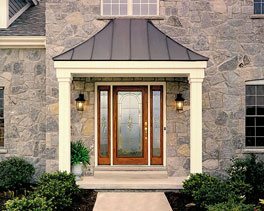 We also offer top-quality home windows, gutter systems, and gutter protection as well as garage door and exterior door installation. The exterior home remodeling products that we offer are some of the best available on the market. Our custom replacement windows, for example, are manufactured by industry leader Alside and come with a variety of beneficial features. Their durable frames prevent warping over time, and their maintenance-free finish ensures long-lasting beauty. Our vinyl windows also have a standard glass package that meets all Energy Star® requirements and will help improve your home’s energy efficiency. Since we opened for business in 1975, we have maintained a dedication to complete customer satisfaction, a claim that is evidenced by our longstanding A+ rating with the Better Business Bureau. To receive a free exterior remodeling consultation at your home in the Kansas City, MO, area, contact Kent Mohler Exteriors today. Seamless Siding Beats All Other Types Of Siding. Hands Down. Seamless Steel Siding won't sag, won't warp, won't melt and won't crack. In over 40 years, I've seen less than two dozen hail claims against Steel Siding, and thousands against Vinyl Siding. Windows and Storm Damage: What to Do? Single Hung vs. 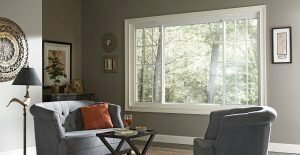 Double Hung Windows: What’s the Right Option for Your Home?